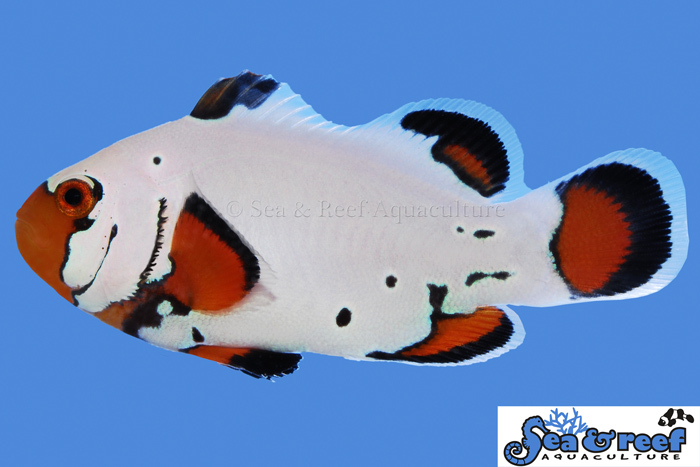 Our Frostbite Clownfish is an Ocellaris designer clownfish that has genetics from both the Wyoming White Clownfish and Snowflake Ocellaris Clownfish. The phenotype resembles mostly the Wyoming White with the uniform white coloration and fins that turn black with age. However, they have black irregular markings in the form of spots and blotches giving them the “Frostbite” appearance. Their Dalmatian like spots turn black and become more pronounced as they grow. Each Frostbite Clownfish is unique and this striking designer clownfish will be a crowd pleaser in your reef tank.